KFMB WFFS Radiothon - Warrior Foundation - Freedom Station | CommitChange | We help organizations raise more money, more sustainably. Send our Warriors Home for the Holidays! 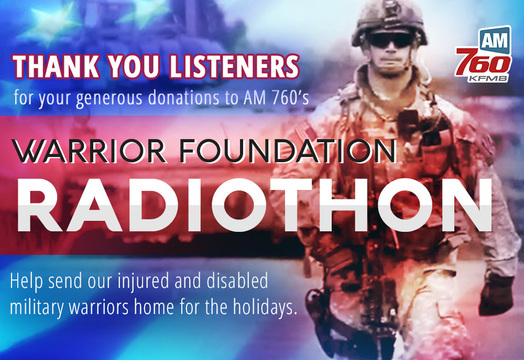 The annual Warrior Foundation/Freedom Station Radiothon took place on Monday, December 7th on AM 760 KFMB. The live, 12-hour on-air event was once again dedicated to raising money to help our injured warriors, many of whom are going through rehab here in San Diego. Through the generosity and kind spirit of our community, this year's Radiothon raised nearly $430,000 to help send those military heroes home for the holidays. You can still contribute through this page - DONATE TODAY! Mike Slater had the opportunity to talk with some warriors who have benefitted from the AM 760 Radiothon in years past. Click on the warriors below to watch and listen to their stories and see how your donation can help.